MINNEAPOLIS (AP) When John Wall is out for Washington, the Wizards are going to need contributions from a variety of players. 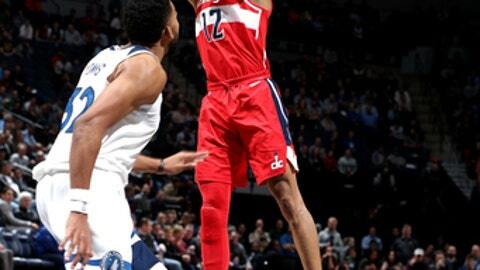 Otto Porter Jr. stepped up Tuesday night. Porter scored 22 points, including a 22-foot jumper with 25 seconds remaining, and the Wizards held on for a 92-89 road win over the Minnesota Timberwolves. Washington trailed for most of the final period. After Porter’s jumper made it 91-89, Minnesota had two shots at the other end but couldn’t convert. The Wizards got the ball back with 4.2 seconds remaining when the ball went out of bounds off Timberwolves forward Taj Gibson. Officials originally ruled that Minnesota maintained possession, but a review overturned the call and gave the ball to Washington. The Wizards’ backups played a key role in the victory. Washington’s reserves outscored Minnesota’s 18-7 in the fourth quarter and 49-11 for the game. Kelly Oubre Jr. added 16 points for Washington, which played the opener of a back-to-back. Fellow reserves Jodie Meeks and Mike Scott each scored 12 points. Brooks felt comfortable leaving much of his second unit on the floor in the fourth. Oubre, Scott and center Ian Mahinmi all played more than 10 minutes in the final period. Starters Markieff Morris and Marcin Gortat didn’t play at all in the fourth. ”The good thing about our team, we’ve got guys that are willing to sacrifice and they understand that just because you start doesn’t mean you have to finish the game,” Brooks said. Karl-Anthony Towns had 20 points and 15 rebounds for Minnesota for his league-leading 18th double-double. Jimmy Butler had 17 points and 10 rebounds, and Gibson finished with 16 points and 11 boards. Point guard Tyus Jones, filling in for the injured Jeff Teague, had 12 points and tied a season high with seven assists. Minnesota led by as many as 12 in the first half before Washington responded with a 16-2 run for a brief 34-31 lead. The Timberwolves closed out the first half on an 11-4 surge for an eight-point lead at the break. The Timberwolves were without Teague and reserve forward Nemanja Bjelica, who were sidelined by injuries. With its depth depleted, Minnesota’s second unit struggled. Towns had a brief scare in the first quarter when his knee collided with the knee of Porter. Towns remained on the ground briefly, holding his right knee, before returning to action. He was eventually replaced by Gorgui Dieng but returned later in the quarter. Porter scored 13 points in the third to keep the game within reach. That included a trio of 3-pointers for the fifth-year forward that helped trim Minnesota’s lead to 71-68 after three. Wizards leading scorer Bradley Beal was held in check. Beal, who came into the game averaging 24.2 points, had eight points. It was just the second time this season he has been held to single digits. Wizards: Wall missed his second straight game with a sore left knee. … Washington snapped a two-game losing streak. Timberwolves: Minnesota is 1-3 in the first game of back-to-backs this season. With a basket in the fourth quarter, Towns surpassed 4,000 points in his young career. The 22-year-old Towns needed 18 points coming into the day to reach the milestone. Wizards: Visit Philadelphia on Wednesday. Timberwolves: Visit New Orleans on Wednesday.